that's a lot of wetness. glad you are safe...beautiful words, the web image is fantastic! So amazing. Just beautiful! Glad you are safe and (mostly) dry. The spider webs look like necklaces of diamonds!! Beautiful! Hope you are drying out! So glad you're safe. I love all your shots. oh, my heart sank for a minute there, elk, I forget then remembered where you lived. thankful you are safe, and hope the wet in the family room is not too serious. Glad to hear you are safe...hope the living room clean up goes ok. Have been floods in our state too, much rain in surrounding towns and so forth. Crazy! Love the web photos so much. I am glad you and yours are okay! Gorgeous pics portraying Nature's beauty, while she had fury! glad you are all okay. 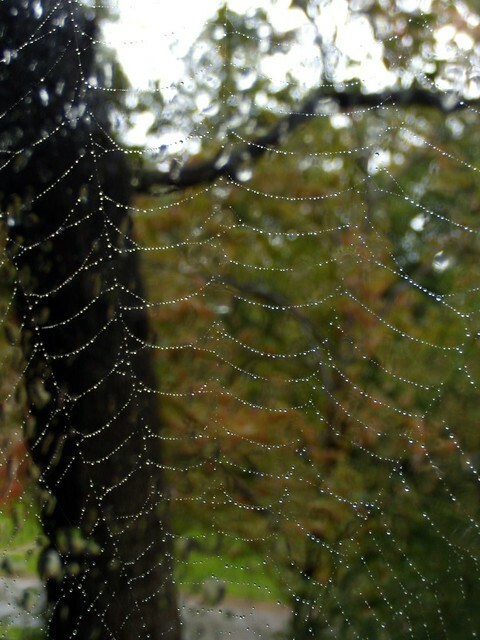 love the rain drops on the web! Sorry to hear of your leak, but glad you are well. Spider web shots are fantastic. the huge spider web is amazing ! What amazing photos! Makes me wish a rainy day was in my future. It's interesting how something so beautiful such as rain can also be a threat. The power of nature is astounding. Gosh, stay safe and dry. Beautiful web! glad all is well. these are strong images with your words. that's a fantastic web photo. love the detail and color. these are gorgeous images of rain to be remembered. the most in 60 years, i heard. from a hurricane, no less. happy yo all are safe. The storm certainly left some beauty behind glad you shared it with us. With that much rain you were fortunate to have just one leak ... glad you could stay safe and dry inside. I'm glad you are all safe. Our son and his family missed the storm as they are up here visiting. I love the web photos. It's amazing how they stand up through all kinds of weather. Wow, glad you are all safe and that you made lemonade (these beautiful photos) out of lemons (the storm). Oh my, Hermine invaded?! Those are scary times...I remember being in a tropical storm in Florida one September and having the water slip in under the cinderblock walls. Glad you hung on and found these beautiful pictures. Have a great weekend, ELK. And I love that cob-web! So glad you escpaed unharmed from the storm...and those photos are divine! Wet but safe - thank God. Lots of damage? I am very glad you are safe. 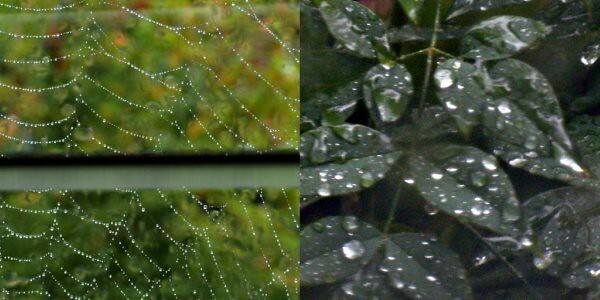 I love the raindrops on the spiderweb! It just amazes me how strong their webs are. 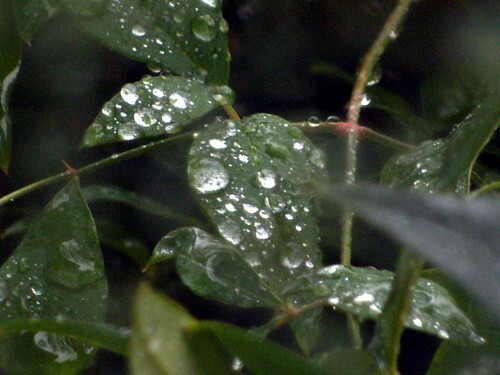 Fantastic rain-soaked images. Glad to hear you survived..albeit just a little worse for wear!! That's a lot of rain. I'm glad you're safe. Amazing photos! I just love the jewelry of the spider web. Beautiful. Beautiful photos. Hope you are drying out. I'm so glad you are safe. Wish we could have taken some of that rain off of your hands. We could have used a little in these parts. these are amazing images, shows the tiniest as part of the whole weave. Oh dear, I hope that you are high and dry now and that no permanent damage was done. It is always such a mess to clean up after something like that. Your photos are beautiful though, that last one is breathtaking. Your beauty always shines through. sorry you hve that to deal with... glad you are safe w/o a ton of damage. 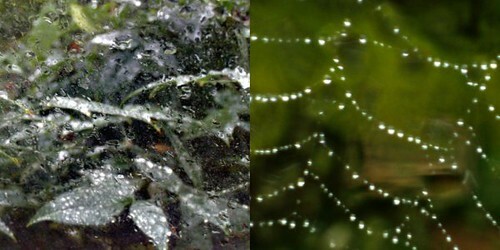 the web-beautifulbeautiful.beautiful.